FILE - A radiologist uses a magnifying glass to check mammograms for breast cancer in Los Angeles, California, May 6, 2010. “It's great news” for patients, said the study leader, Dr. Helena Earl of the University of Cambridge in England. Earl has consulted for Herceptin's maker, Roche. The company had no role in the study. FILE - Chemotherapy drugs are administered to a patient at North Carolina Cancer Hospital in Chapel Hill, North Carolina, May 25, 2017. Health experts are stepping up warnings as more cardiac side effects of some breast cancer treatments come to light. “There's no reason to not immediately change practice. The findings are persuasive,” said Dr. Richard Schilsky, chief medical officer for the oncology society. 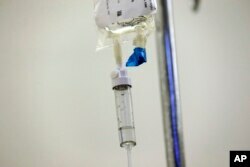 Most of Herceptin's cancer-fighting benefit seems to come in the early months of use, he said. Dr. Harold Burstein, a breast cancer expert at Dana-Farber Cancer Institute in Boston, said shorter treatment may increase access to the drug in countries where many women can't afford it now, but that in the U.S., “my guess is that people will continue to aim for a year of treatment” because of lingering concerns that longer use is better, as a smaller, previous study suggested. “It's really important that we continue to have public funding for trials so we can continue to ask all of these questions for our patients,” she said. Herceptin's developer, Genentech, now part of Roche, said in a statement that the new study must be viewed along with several smaller previous ones that found one year to be best. The goal of treatment “is to provide people with the best chance for a cure,” so women need to talk with their doctors about how best to reach that goal, the statement says.